Home > Our Blogs > Learn+Teach+Share > Who will lead us into the future? David Burstein is a 23 year old Facing History alumnus who thinks deeply about the role of young people in making change. He started the Westport Youth Film Festival while he was in high school, and is the executive director of Generation18, the nation's largest youth run voter engagement organization which he founded in 2006. In this excerpt from his new book "Fast Future: How the Millennial Generation Is Shaping Our World" David looks at the attributes and experiences that have made his generation one with the potential to make a huge impact on our future. “You are the future.” It seems like the right message. I’ve heard politicians give this speech to groups of high school students. I’ve heard it from distinguished men and women speaking to graduating college seniors. I’ve heard it from parents speaking to their teenagers. But my generation is not the future. We are the present, and we’re already making a major impact. Think about the twenty-eight-year-old who created and runs the largest social network in the world, or the thirty-one-year-old who directs the White House office of speechwriting, or the high school students in Danbury, Connecticut, organizing their peers in an effort to end the genocidal crisis in Darfur, half a world away. From the streets of the Bronx to the streets of Tehran, from inside the West Wing to the tech labs of Palo Alto, from rural Ohio to the mountains of Nepal, the millennials have seized hold of the world around them, decided to make a difference, and are doing it right now. What’s more, they’ve been doing it for the last decade. It took us a long time to get here. At the beginning of the twentieth century, the industrial revolution was accelerating. The prior century had given us the steam engine, railroads, powerful looms, interchangeable parts, and the cotton gin. These innovations paved the way for a political and cultural infrastructure that resembled the hierarchical factory system. But now the industrial revolution was moving into a new phase that would see quantum breakthroughs in technology—automobiles, airplanes, and the harnessing of electricity and light—and that would also bring about a radical set of democratizing political and cultural paradigm shifts. To a society accustomed to railroads and horses, the world seemed to be in a state of chaos. Government-sponsored compulsory education, women having the right to vote, and the progressive reforms that curbed abuses of monopoly power and child labor and allowed workers to organize labor unions all seemed radical. Some businessmen didn’t see how different the new era would be. Some refused to adapt. Some tried, and failed. When the winds began to shift, the business titans of an earlier era missed the flight to the new industries of the future. Younger upstart competitors emerged, confident in their ability to harness new discoveries as well as comfortable with the shifting social and political realities. When the dust of this new industrial revolution had settled, the visionaries of the early twentieth century emerged—people like Thomas Edison, who imagined a new world of electric power without worrying about its effect on railroads or carriage and buggy manufacturers, and Franklin Delano Roosevelt, who saw the opportunity to enact a century-defining New Deal. Their visions were so powerful that they still play a major role in shaping our world today. The new breed of leaders was comfortable with change. They saw and embraced the new world that was fast approaching. They let go of their preconceptions and not only adapted, but succeeded. The accepted truths of the Anglo-American gilded Victorian age—about race, religion, and the limited role of government in the economy, among many other questions—eroded amid a new world order of technology, immigration, urbanization, consumerization, reform of capitalism’s most outrageous disparities, and the first stages of demographic diversity. Once every few generations, there is a revolution that shifts the fundamentals of our economy, society, culture, communications, and social relations in this kind of top-to-bottom way. We are living through a period like that today. The modern world has always been in a state of flux. Indeed, some significant frequency of change is definitional to modernity. But the impact of change has arguably never been as sweeping or disruptive as it is today. This is in part because the rate of change itself is exponentially greater than it has ever been. As a result, more transformation takes place in a single year than in some previous decades. New technologies are being adopted at an exponentially faster rate. Consider this: When the Palm Pilot was introduced in 1997, it took eighteen months to sell one million units—and was considered a stunningly transformational product as a result. Yet it took just twenty-four hours for the iPad to sell the same amount immediately after its introduction in 2010. Political change is also happening more rapidly. Though many politicians of the nineteenth and twentieth centuries spent years building their resumes and relationships so that they might one day be able to run for president, in 2004, a little-known state senator keynoted the Democratic National Convention and was sworn in as president five years later. In 2010, the Tea Party wiped out much of the Democrats’ congressional power. Yet the Tea Party itself, seen as a sweeping game changer, crumbled only two years later. Similarly, the Occupy Wall Street movement gathered and reached massive visibility in late 2011, only to be swept away and virtually disappear in the first few months of 2012. This is part of the new world order. This is the fast future. Change is fast and constant. In the fast future our culture, institutions, government, and citizens don’t always have time to catch up with these tsunamis of reinvention, so they are often left dizzy, surprised, or angry. As these institutions and their leaders are trying to figure out the new world, one generation hasn’t had much trouble adjusting: my generation, the millennials. 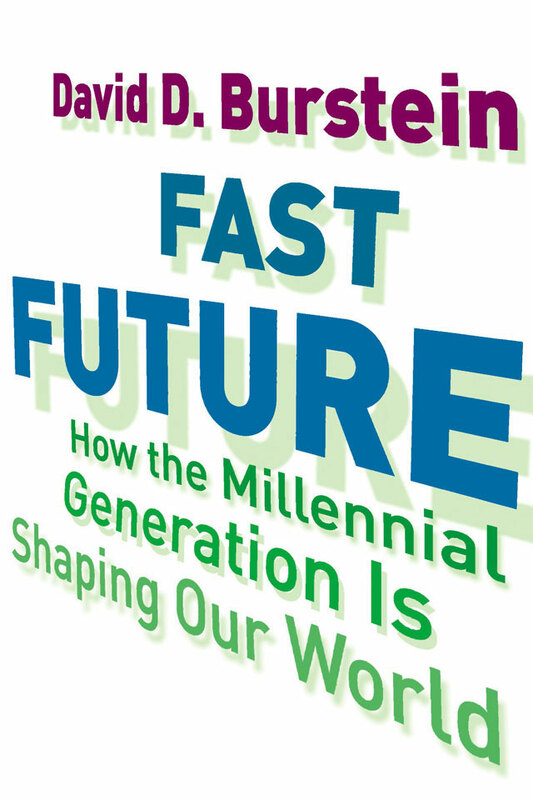 Excerpted from Fast Future: How the Millennial Generation Is Shaping Our World, by David D. Burstein, (Beacon Press 2013). Reprinted with permission from Beacon Press. David will be speaking about Fast Future as part of the Millennium Forum Lecture Series on Monday, April 8, 2013 at 7:30 pm Beverly Hills City Hall - Council Chambers, 455 North Rexford Drive. For more information please click here. For more information on Fast Future click here.